France may be the top tourist destination of the world, but there are some things which even the mighty France cannot guarantee. India has finally understood her own potential as a tourist destination being blessed with both natural as well as cultural beauty. In a bid to attract more tourist towards India, The government has begun giving out Indian E-Tourist visa for Citizens of France among other countries. Understanding this global demand the Indian government has made the visa application process a lot easier than it was earlier. French citizens have since been lapping up E-tourist visas availing over 65000 visas in 2016 alone. The number of e-Tourist visas for 2017 was projected to be at least 80,000 marking a decent increase over the previous years. We provided around 17,000 hassle-free visa service for tourists in 2017. The ETVs (Electronic Travel Visas) were implemented with the intention of making the application for India visa a lot easier but the implementation of the e-visa system by India is abysmal with frequent crashes and website going dead when you have to fill in the last field. This article will guide you on how to get your Indian E-Tourist visa approved easily as a French citizen. Is it possible for French citizens to get a visa on Arrival at the airport? Since the implementation of ETV’s visa on arrival facility has been replaced with ETV’s like most of the other countries. From 2015 onwards, it was made mandatory for anyone visiting India have a valid electronic visa before they arrive in India. In fact, airlines have to make sure that you are holding a valid India E-visa before you board your flight to India. In order to avoid the confusion tourists had, the Indian government renamed the visa to “E-Tourist visa” If you arrive at any Indian air/seaport without a valid visa, you will be deported in the next flight home. How long does it take for French Citizens to get an E-Tourist visa? Once you have submitted all the documents and have successfully completed the application and payment process it usually takes 1-2 days to get your visa approved. Also, India E-Tourist visa must be applied at least 4 days before your travel. To avoid the last minute confusions we suggest you apply 10 days prior. After you successfully complete all the application process, officers from the concerned department of the Indian government will verify your visa application. After approval, you will receive your visa through email. E-Tourist visas and E-Business visas hold double entry benefits while medical visas have triple entry benefits. The visas are both non-extendable and non-convertible. The visa is valid for 60 days. The visas are both non-extendable and non-convertible. You should avail a sticker visa with 10 years validity is you need a multiple entry visa. For 10 year visas, you need to personally apply at the concerned Indian embassy after taking a prior appointment to do so. How much does it cost for India E-Tourist visa for French citizens? It costs French citizens $80 (71€) for India E-Tourist visa. The credit card processing companies take a service charge of 2.5 %. Contact us if you want to enjoy hassle-free and best in the class visa service. We charge a processing fee of $25. 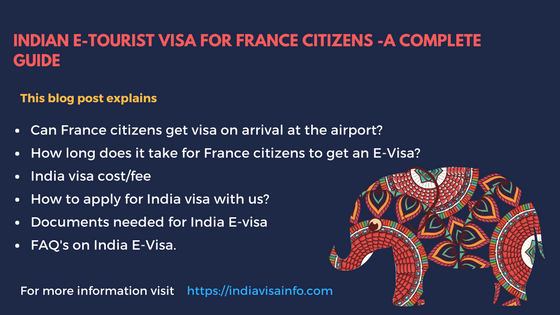 What are the requirements for India E-Tourist visa for French passport holders? You also need to keep all the details of your parent’s passport and your work-related information handy.You will need them when applying for your Indian e-visa. Your passport must be valid for at least 6 months with at least 2 blank pages for stamps. Make sure that you cover all the points mentioned below. Is it easy for French citizens to apply for India E-Visa? The Indian Online Visa portal being poorly built with the servers crashing frequently makes the online visa application process cumbersome against the claims of being very easy. The server crashes out mostly when you have filled 80% of your application or you may encounter the dreaded payment problem as the banks are incapable of accepting any kind of payment other than the one where someone has to physically go to the bank and make a payment against your visa application. One of the major drawbacks of the payment portal is that you can only try a maximum of 3 times to successfully complete the payment. If you fail 3 times, your application will be blocked and you will need to start applying from the beginning. If you want to avoid all these hassles and get your E-Visa with minimum hassle you can avail our service. You will need to fill in the below form and we will help you get your Indian visa within 2 days without any hassles. You have to print a copy of it to carry with your passport and bring it when you arrive in India. We recommend that you print two copies and keep one with your files. When you arrive in India, you must have a print of your E-visa with your passport. You will need them when you go through immigration clearance. If I only want your assistance in making payment against my visa application and not complete the full application, do I get a discount? 50 % discount on our service fee is given to customers who want our help only to make a payment. We charge only $ 25. How many times can I apply for E-Tourist visa in a year as a French citizen? You can avail an E-Tourist visa only twice in a calendar year. You need to apply for a sticker visa which is valid for 10 years If you need a visa with longer validity. ETVs are also valid for entry at the following three designated seaports: Kochi, Goa, and Mangalore. In addition, separate immigration desks and help counters have been set up to assist medical tourists at Delhi, Mumbai, Kolkata, Chennai, Bangalore, and Hyderabad airports. Our agents will collect all the required information from you within 12 hours.Once we have all the information we need from you, we will apply for India visa on your behalf. It may take us 2 working days at most to get your E-VISA. Got my India Visa in time i am very happy about their service.